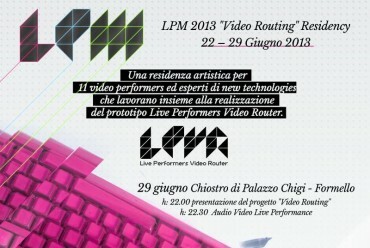 LPM Live Performers Meeting presents the Video Routing Residency which will be held June 22 to 29 at Palazzo Chigi in Formello (Rm), new cultural center of the city, now the Museum of Agro Veientano and the Public Library. Mauro Ferrario (IT), Nikky (IT), Bruce Lane (FR), n0syntaX (IT), Mario Guida (IT), Tim Vis (DE), CtrlAltLab (IT), EccKer (MEX), Thomas Sanchez (MEX), Emanuele Foti (IT). For the duration of the residence, participants will be accommodated in the new Hostel inside the Palace and will have the opportunity to develop ideas, exchange experiences and share content. On June 29, at 22:00, in the Cloister of Palazzo Chigi, after a short presentation, you can watch the end result of this artistic research that will give visibility to the path by a spectacular performance Audio Video Live on 3 screens. Introducing Gianluca Del Gobbo, organizer and creator of the Live Performers Meeting and Carlo Infante, journalist, lecturer and expert in performing media. The artistic residency of LPM 2013 is produced with the assistance of the Province of Rome and the collaboration of the City of Formello. Knowledge of Video Cards and video chipset both in terms of view of software and hardware, C + +, OpenFrameworks; Electronics, frame memories, signal handling. To the participants will be offered travel, food and accommodation and is provided the purchase of necessary hardware.